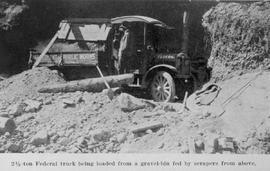 "2 1/2 ton Federal truck being loaded from a gravel-bin fed by scrapers from above." Department of Public Works truck. A Federal Motor Company dump truck in Vancouver; note the Sun Tower in the background. 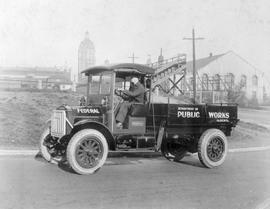 Alberta Department of Public Works truck. City Of Vancouver Truck Outside The Canadian National Railway Terminal. Training film. The basics of vehicle upkeep and safe operation for employees using government vehicles. Probably shot in and around Kelowna.